By Allah’s grace. this is the second part of what shall be. insha’ Allah. a three part series on the rules of tajweed of the Qur’an. for the recitation of Hafs from ‘Aasim by the way of Ash-Shaatibbyyah الشاطبية. The book is intended to be a guide for non-Arabs with a good grasp in English in studying tajweed. This book explains the concept of the accent (an-nabr) in the recitation of the Glorious Quran and the conditions of its use. it also defines and explains the important chapter on the characteristics of the letters, velarization and attenuation (tafkheemتفخيم and tarqeeq ترقيق} are covered in this part, as well as the concept of the two alike. the two similar. the two close, and the two far and the rules for idghaam إدغام and ith-haar إظهار in these different relationships. A brief introductory to grammar terms is made in this book to assist the student in understanding the last chapter. that of the connecting hamzah (harazah al-wasl همزة الوصل). The explanations of the different subjects are in English, and the Arabic terms are translated. This is to assist the student in understanding and encourage them to learn the Arabic deﬁnitions and terms. This book should facilitate non-Arabs studying tajweed whether they are in a classroom with explanations taught in Arabic or in English. This book cannot replace the importance of reciting to and being corrected by a trained teacher of tajweed. 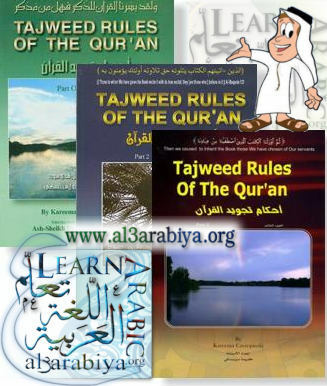 instead it is a guide and an aid in understanding the concepts of tajweed. the application can only be reﬁned by recitation and correction. It says invalid pdf file. Please I’ll really appreciate if you can re-upload a valid version. checked and it is working well, try to redownload it. Jazakumullahu khairan. I believe it may be from my network. I re downloaded the file several times but each time it cuts off before it gets to the end and it seems the freearabic.org doesn’t have resume capability on their server. Nevertheless I was able to successfully download the file. But now I’m experiencing the same problems with other books. Maybe its the server…maybe its my network…Allah knows best. I very much appreciate your efforts. May Allah grant you and your team the highest of Jannah. Jazaakumullahu khairan. I truly appreciate this. May we meet in the highest of Jannah.